Oh my core! You'd think that with the title "Core Values" I would have known my core muscles would be getting the workout at this new Equinox class launching this November. But are these moves really supposed to hurt this much? Is my core really this weak? Am I really this bad at functional movements? Yes--but for good reason. I've been going to workouts, except I can't say that any of them actually focus on our cores for the entire session. Sure, there's the Ab Blast here and there, but that's 15 minutes all about the midsection. And if you've heard people preaching about our core muscles, then you know that our core is so much more than just abdominals. That's exactly why I can benefit from a class like Core Values. It's way more than 45 to 60 minutes of work. For starters, you're not going to see those love-to-hate crunches. These core moves are more complex--like crunching your arms and legs--than the basics that only work the frontal line. "Core Values is integrated movement that works the frontal, lateral and spiral lines in combination and succession," says Jenn Hogg, group fitness manager at Equinox's Gold Coast location. That doesn't translate to easier moves...unless my core really is weak (which would be completely plausible) and I've just been in denial for years. Class consists of three stations that focus on cardio, power/strength, skill mastery/balance, and core: the Parallette Bar, Floor and Wall, and Drills and Conditioning. You do a prescribed exercise at each station for a set time before rotating to the next station. The twists, push ups and bends--only some of the class's moves that use your body weight, parallette bars and Dynamax balls--get progressively more difficult as you rotate through the stations. Lunges gain air time, parallette push-ups pair with mountain climbers, and medicine-ball crunches get extra twisty. "The exercises build from week to week so that as your skill/strength levels improve, your body is continually challenged," Hogg says. Class might start easy, but once that final compound exercise is introduced, you're wondering what was thrown at you--and how you can do the third exercise when you have yet to master the second move (that's where class homework comes in, but I'll get to that). At least it's only your brain that's getting confused as the moves get more complicated. I thought I was compromising my workout when I couldn't figure out the third step, yet my core was screaming for some R&R the next day. The results? You'll gain better movement during every day activity--and a stronger power center. "It will literally enhance everything you do and the way you do it," Hogg says. "Core Values is designed to work the power center from the inside out--combining intervals of cardio/power, strength and balance that all have a central core conditioning component to each circuit and station." But there's a catch to this functional training. You have to do your homework if you want to get better at Core Values and go from flopping across the parallettes (that'd be me when my arms gave up on supporting my body) to whipping through tricep dips and leg swings. It's not the kind of homework you'll get graded on, and it's optional, but it's enough outside work to give you a workout outside of class--and one that'll prepare you for the next session. Check out Core Values this winter at Equinox. Preview classes started in October, and class is in full swing starting this month. Your core will thank you. 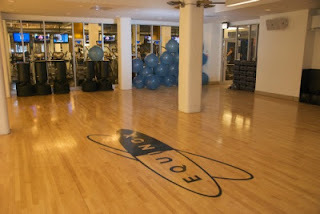 Photo courtesy of Equinox, Lincoln Park Chicago location.